5 Broken Cameras, Oscar-nominated, and controversy on Palestinian Documentary? “”Five Broken Cameras” Palestinian film director on CNN: “I have no memory of a time without struggle”. Who is Emad Burnat? Emad Burnat, a Palestinian farmer and director of the Oscar-nominated documentary “5 Broken Cameras“, which he co-directed with Israeli Guy Davidi, reflects on his family’s experiences living in the West Bank and as part of the Palestinian non-violent resistance movement. (CNN) — I come from Palestine. I have lived my entire life under military occupation, and I have no memory of a time without struggle. I have seen my neighbors beaten, blindfolded, and kidnapped. I have seen children snatched from their mothers in the dead of night. I have seen my brother shot and friend murdered. I can’t tell you how this holy land felt before the armored jeeps’ rumble. I can’t trace a path from here — from where the Wall surrounds me — to the sea. But for as long as I can remember, I could not forget. Forget the checkpoints, the harassment, the detentions. Forget that I am not free. Like all prisoners, my memories are what sustain me. But what I need now are new memories. Happy memories. That’s why I started filming. I wanted to make memories of my son, Gibreel. I wanted to capture his smile, to chronicle his life in close-up. I wanted to crop out the occupation, the violence, the hopelessness. You know the scenes. Maybe you, too, have captured your loved ones’ firsts: the first words, the first steps, the first glimpse of that way he angles his head and grins. Just like his mother. Soraya’s gentle voice is in so many scenes of our son’s early life. But as I continued filming, Gibreel taught me that there are other sounds more urgent in his world. His first words were “army” and “wall”. His first steps were in the shadow of groaning bulldozers and screeching cranes. Not the kind children play with. The kind that build the colonies that are stealing our land. Our land is Bil’in — “a little village on a hillside.” That’s how the British described it a century ago, when we had already been there for many more. We are fewer than two thousand people, and we tend the land. We have no factories or office towers. There are no commuter trains or carpool lanes. For centuries, our walk to work has led through biblical fields of olive trees. They are English, French, Swiss, American. Some say there are 50,000 or more. They use our precious water to wash their cars and fill their swimming pools. They seem to thirst for pavement, cold steel, and concrete. And when they weren’t satisfied with what they had already stolen, they came looking for more. They came looking in Bil’in. We did so peacefully, but persistently, through nonviolent protest against the Wall cutting through our land. Throughout, our only power was our conviction. 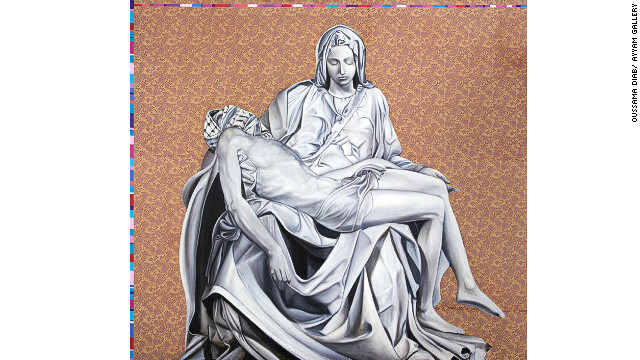 And that conviction drew others — English, French, Swiss, American. And Israelis. One of them is my friend Guy Davidi, who helped me make a film. Five cameras and as many years later, I invited the world to see scenes from my son’s first years-because the story of Gibreel’s early life is also the story of Bil’in’s resistance. The world calls it a documentary. I call it our story, a Palestinian story. Soon, this Palestinian story will contend for an award. It is a very big award, and many people will be watching. If it wins, what would I say? How does a Palestinian, from a little village on a hillside, address the world? I close my eyes and imagine the scene. There are a billion people, but I see just one. It is you, Gibreel. You are a man, perhaps my age now, looking back at the 35 years that brought you there. What will you see? What will your world look like? And if you had a camera, too, what memories would you make? As the world listens, Gibreel, I want to say to you: I am from Palestine. I have lived my whole life under military occupation, and I have no memory of a time without struggle. But you, son, you will know better times. Someday, you will make new, happy memories. And that will be the true award. 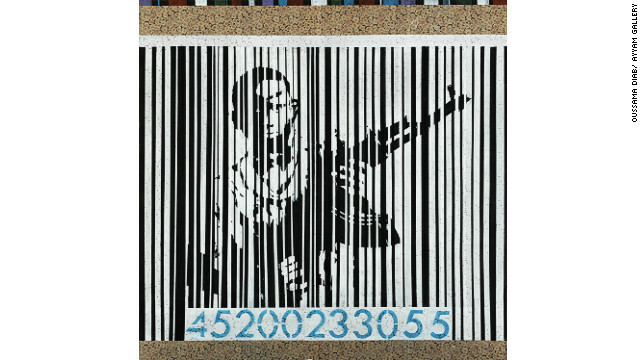 In “Barcode 1,” said Diab, the child behind the barcode is the victim of people who are dealing in weapons and driving children to take up arms for their own interests. 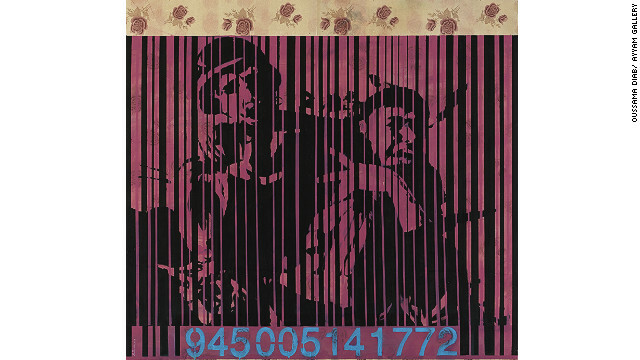 This picture, called “Barcode 2,” is taken from a photograph of one of the Palestinian intifadas and, says Daib, shows how politicians advertise violence. 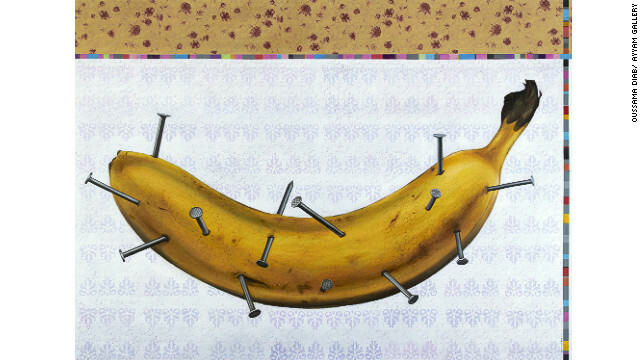 “Although the picture is from the Palestinian intifada, it refers to all violence everywhere,” said added. 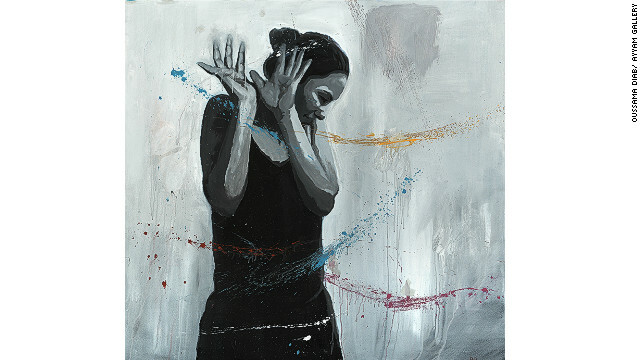 Diab says this picture was inspired by the saying “Free in my own freedom.” He said it is a positive artwork, where the woman is free to color her own life to make it better. “She is free from old ideas,” he said. 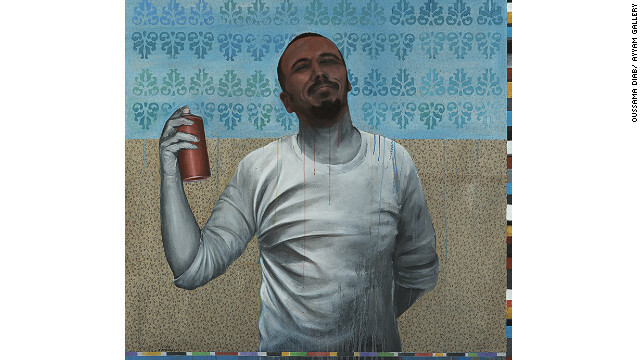 Oussama says this picture came from the idea of spraying on walls to represent freedom. “Instead of writing the word freedom, this man is spraying his own brain and ideas to express freedom,” he said. Noor Daoud, 23, in her BMW. Daoud is about to compete in a professional drift race in the United Arab Emirates, which she hopes will be the start of a top-flight international career. The Speed Sisters say many people have no idea they are women until they take their helmets off. 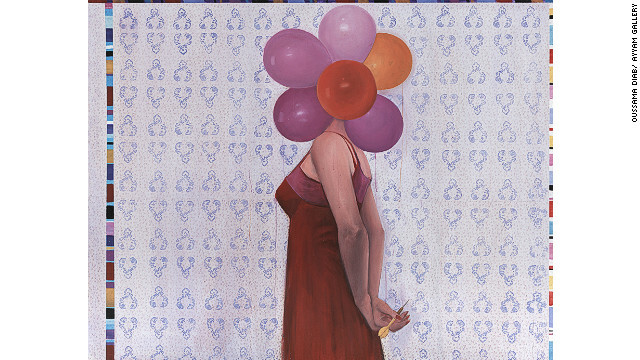 These are (from left): Betty Saadeh, Noor Douad, Marah Sahalka and Muna Ennab. Marah Zahalka taking a turn during a race in Bethlehem. 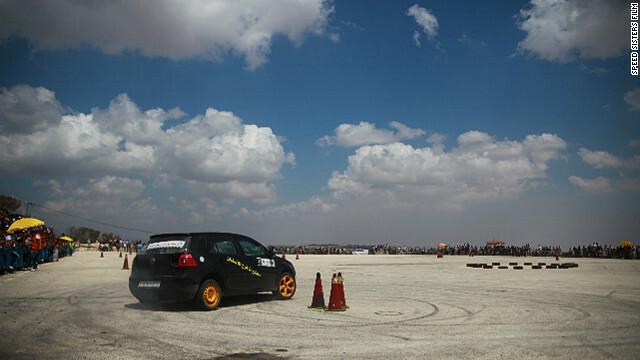 Palestinian street car races, held at makeshift venues such as airfields, often attract 1,000 spectators. 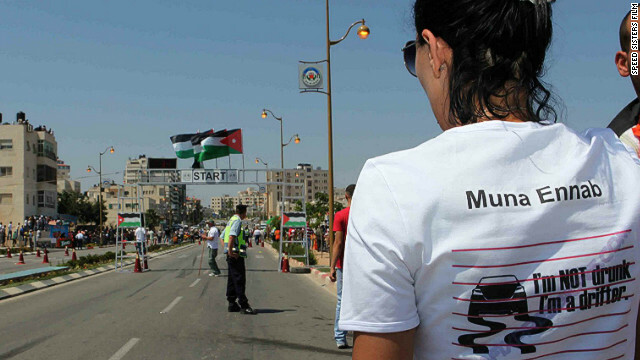 Muna Ennab watches a race in Ramallah. Her t-shirt refers to drift racing, a driving technique in which the driver deliberately oversteers and the rear wheels skid. 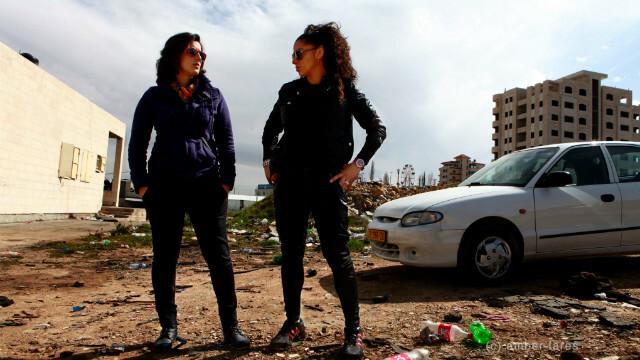 Marah Zahalka (left) and Noor Daoud, the two youngest Speed Sisters, both in their early 20s, are close friends and fierce competitors. 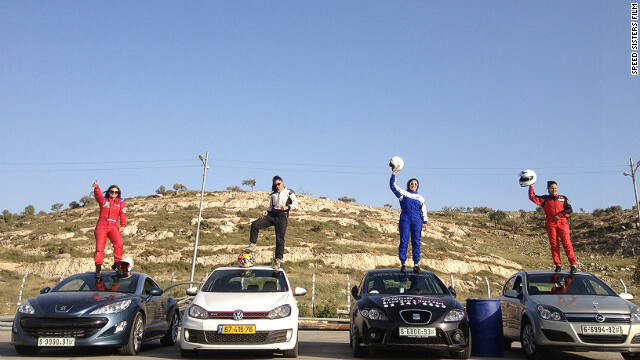 Betty Saadeh, from Bethlehem, joined the Speed Sisters in 2010 and was the fastest woman on the Palestinian circuit in 2011. Both her father and brother also race cars. Marah Zahalka with her father Khaled, who has supported her career. Some of the Speed Sisters have received encouragement from their families, while others have had to persuade them of their choice.